Sudershana Devi, JWCCLEA president, along with other office bearers, addressing a press conference on Thursday. 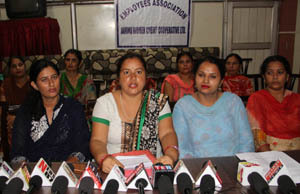 JAMMU, Aug 30: Jammu Women Credit Cooperative Limited Employees Association (JWCCLEA) had demanded enquiry into the credentials of two employees of the organization who are harassing other employees by posing as CEO and MD. Addressing a press conference here today, Sudershana Devi, president of the Association said that the branch heads of Gura Slathia and Rangpur Mulana are interfering in the work of employees of other branches by posing as CEO and MD, while reality is that they themselves are employees of the organization like other workers. “Every another day, they visit other branches of JWCC and seek records by posing as CEO and MD. They are hell bent to create problems in functioning of about 36 branches by harassing the employees”, she added. The association president said that these so called CEO and MD direct the employees to deposit all the amount of the branches in their accounts. “Moreover, these self styled CEO and MD visit other banks near branches of JWCC and ask the bank managers to close the bank account of JWCC employees”, she said, adding employees of JWCC are feeling stuffiness in these circumstances. 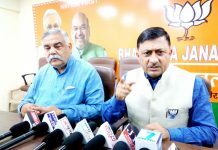 She appealed Registrar, Cooperative Department to enquire into the matter and put strict check on the unauthorized functioning of these self styled CEO and MD.